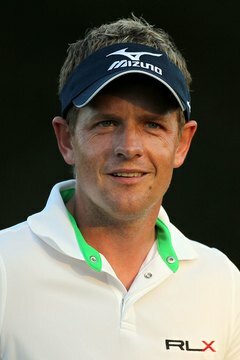 Luke Donald had plenty to smile about after earning more than $6.6 million on the 2011 PGA Tour. Professional golf can be a lucrative profession for the few who are good enough to play on the PGA Tour. In 2011, for example, Luke Donald led all Tour players with $6,683,214 in earnings, according to the PGA Tour’s website, while 89 players earned at least $1 million. Players earn money based on their performances in Tour events; the higher a player finishes, the more money he earns. The formula for distributing a non-major tournament’s purse is set by the PGA Tour. Determine the tournament’s total purse. Each PGA Tour event offers its own purse, which is announced well before the event takes place. Match a player’s final standing with the percentage of the purse assigned to his position. The PGA Tour allocates 18 percent of a standard tournament’s purse to the winner. The remainder of the top 10 finishers receives, in order, the following percentages of the purse: 10.8, 6.8, 4.8, 4, 3.6, 3.35, 3.1, 2.9 and 2.7. The percentages continue to decline down to the 70th place finisher, who receives 0.2 percent of the purse. Players who don’t make the 36-hole cut receive no prize money. If more than 70 professional players make the cut, each position from 71st place on down receives $100 less than the previous position. For example, if the purse is $5 million and 72 pros make the cut, the 70th place golfer receives $10,000, the 71st receives $9,900 and the 72nd $9,800. If fewer than 70 golfers complete a tournament, prize money for the vacant positions is not awarded. Pass over any amateurs when calculating the players’ earnings. Amateurs occasionally compete in PGA Tour events but don’t accept any prize money, so they’re treated as if they don’t exist when the purse is divided. For example, if an amateur finishes 20th in a PGA Tour event, the 21st place golfer receives 20th-place money, and so on down the list. Divide the money among players who tie for a position. For example, if three players tie for third place in a $5 million event, add the percentages normally awarded for third through fifth places (6.8 + 4.8 + 4 = 15.6), then divide by the number of golfers who tied for the position (15.6/3 = 5.2). Each golfer is awarded 5.2 percent of the purse -- in this case, $260,000 apiece. How Are PGA Purses Split? What Tournaments Did Tiger Woods Win in 2008 & How Much Did He Receive for Them?